Monday night once again, required a trip down to Devonport with one of the kids. I like to use this time to take some photos, while kid does his thing. This Monday though, was a graphic illustration of congestion costs. An accident on Lake Road led to its closure earlier. While it had since reopened, the roads were still clogged with cars. Takapuna was in virtual gridlock. As we sat in the car, I expounded again on the virtues of cycling. These virtues were made more obvious by the cyclists moving ahead of the cars. In the end, we got to Devonport a mere 30 minutes late. A not uncommon occurrence as many other kids were late. Earlier in the year I was able to get shots of dusk and the like, but with the short days, it’s dark by the time I reach Devonport. The only subject I’ve really found worth exploring is the Auckland skyline. The previous Monday I’d photographed Auckland from Bayswater. That made a nice 6-photo panorama. This time I tried Stanley Point. Knowing that all I was going to be able to photograph was a skyline helped lens choice. That’s my 70-200 f2.8 G. The camera of choice is the Sony a7R. Sometimes size does matter…for prints. Being able to shoot 36 MP is helpful. Was it really only 2007 when I was photographing with a 10MP camera? The other essential is a good tripod and tripod head. I’m a fan of the Induro carbon fibre CT314, and a Manfrotto geared head is optimal for landscapes. This time I’m a bit closer than Bayswater. The main photo is a stitched composite of 9 photos. Although I did crop a big chunk of the right edge off. The technique for a panorama is straightforward. Set the camera on manual shutter speed and aperture. This ensures each photo will have exactly the same exposure. The tripod also needs to be very level. So patiently adjusting that is important. Then there’s the actual camera, which needs to be level on both the vertical and horizontal plane. I take the photos in portrait mode to increase the height of the final picture. 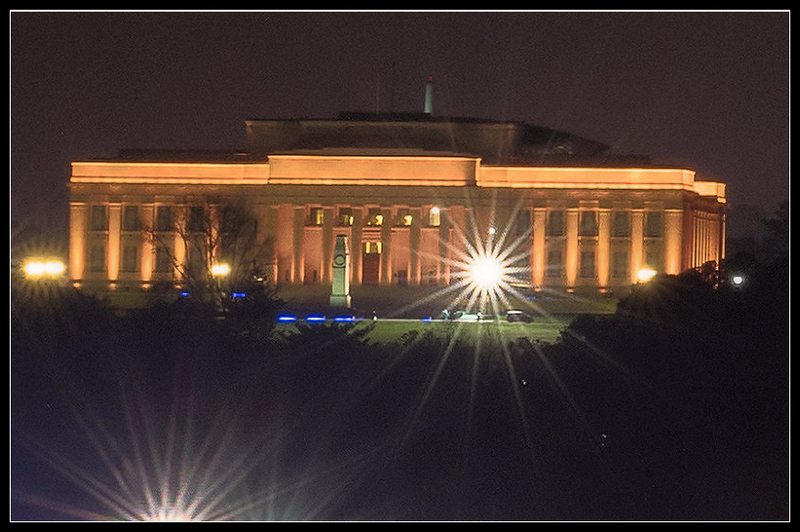 Then move from left to right (I started with the Auckland Museum), taking overlapping pictures. It’s also good practice to avoid any ferries crossing the harbour if you can. They tend to leave streaky lines that don’t map to adjacent photos. Zooming in on some parts, the actual detail level is quite good. The Auckland Museum for example, has a distinct and recognisable Cenotaph. 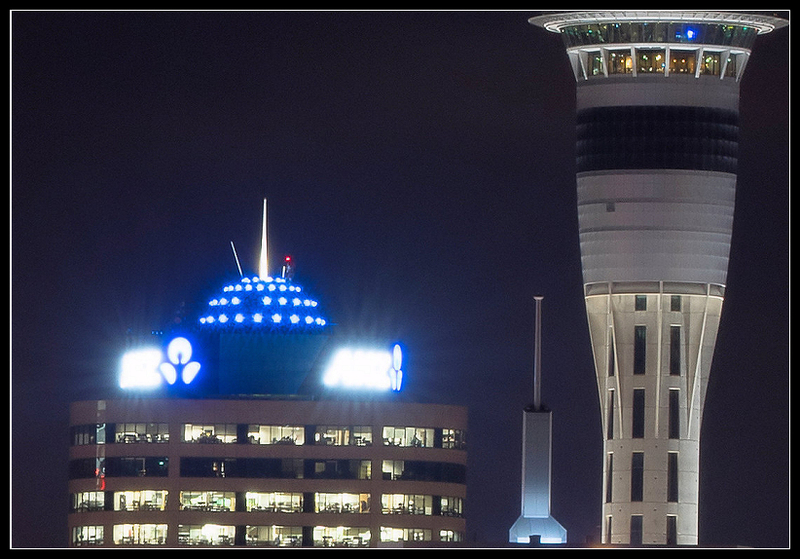 The ANZ building and the Sky Tower are also well defined. This final photo is 21000 by 7000 pixels in size. Or about 147 MP. 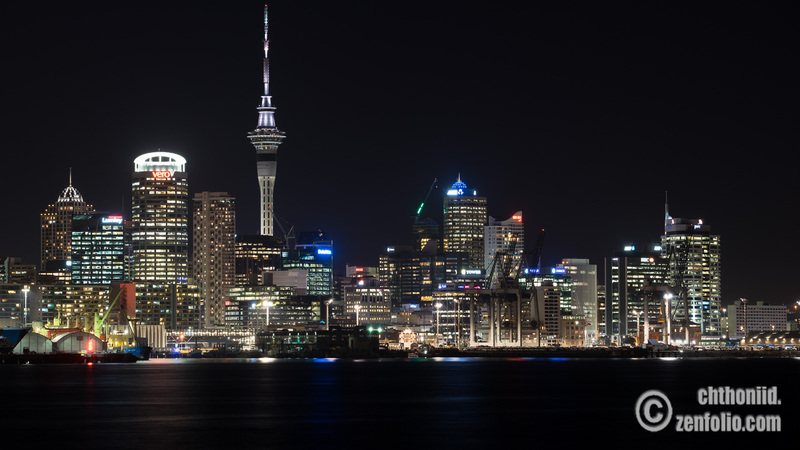 In theory if you wanted a print of the Auckland night-time skyline that was 2 meters wide, then this would do it. The investment in time getting all the shots lined up is also worth it. At the moment I’m just using the Microsoft free ICE panorama editor. It’s basic and works really well if the shots are lined up nicely. If it has to do much correction than weird artifacts appear. I’ve edited the images a little. The panorama needed a slight rotation to straighten things up vertically. And I’ve applied a better noise-reduction plugin to tackle that. They’re minor improvements you probably can’t see in the link provided above, but are more obvious when zooming in at a 100% view.